In the 80’s the Walkman was king. We all had one (or a cheap knock off, usually made by Akai or Alba) and many of us would spend every Sunday night attempting to record the top 40, pausing and un-pausing the tape recorder (that we had unplugged from our Spectrum computer set-up) whenever Bruno Brookes started his inane between-song gabble. The hard work was worth it though if you wanted to be the first in your class to know all the words to the latest Tears for Fears single. As the majority of computer software at the time was also distributed on tape, it was inevitable that games publishers would look to capitalise on the medium, so it was not uncommon to see games include a music track on its b-side or sometimes on a tape of its own. 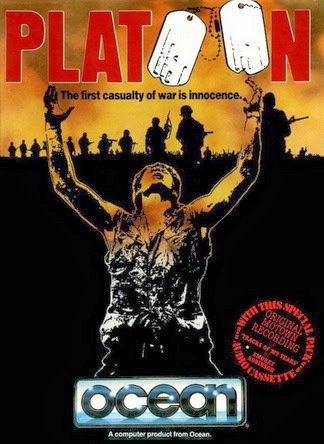 Mostly these would be title themes from movie licenses, such as Smokey Robinson’s Tracks of my Tears that was given away in Ocean’s excellent interpretation of Platoon. But actual bands were looking to get in on this computer lark too and acts like Frankie Goes to Hollywood saw themselves immortalised in 8bit glory with their extravagant and often baffling titular game. Frankie went one step further than most, by not only packing in an exclusive live version of their number one smash Relax, but also including a number of their hits in-game, chiptune style. On the face of it these ‘freebies’ were a wonderful incentive to purchase the games, but in reality they weren’t really that special. Shoving a track that was past its sell by date in terms of the chart-ability was a pretty lazy (and some might say cynical) way of luring in the punters. What was far more impressive were those software houses that took the fusion of music and games beyond regurgitation of back catalogues, creating original tunes and concepts that in some cases, if they had been marketed right could have challenged the charts in their own right. One of the earliest examples this melding of mediums was Automata’s ZX Spectrum extravaganza Deus Ex Machina. This is as self indulgent and eccentric a game as you will find on any system. The brain child of Mel Croucher, it is a fusion of game, story and music into a melting pot of heavily produced multimedia uniqueness that cannot be compared to anything before or since. Whilst released on tape for the Spectrum in 1984 (and then on the Commodore 64 a year later), this isn’t really a game at all, more an interactive story told with the audio and visual eccentricity of a hundred Mad Hatters. The accompanying fifty minute audio tape containing the voices of Ian Dury (without the Block Heads), Frankie Howard (oo-er missus!) and ex-Dr. Who Jon Pertwee had to played in sync with the game-play and stopped or started as requested on-screen. Its strange futuristic play-like production was light-years ahead of its time. Much as Jeff Wayne’s War of The World’s could be understood by listening to the dialogue and skipping the songs, Deus Ex Machina’s audio track could be played in isolation from the game. But as with Wayne’s masterpiece, you would be missing the point and completely misunderstanding Croucher’s undeniable genius. In the sixties, Mike Berry was lead singer of the pop group Mike Berry and the Outlaws and amongst a handful of hits he had a UK number one with ‘A Tribute to Buddy Holly’. He is better known however for his appearances as Mr Spooner in the British sitcom Are You Being Served (where he aptly quit his job to become a pop-star in the last ever episode). In 1985 Mike teamed up with Mikro-Gen to record a musical interpretation of their arcade adventure game Everyone’s a Wally. Mike’s cheeky-chappy-cockney-sparrow style is very similar to Chas and Dave and was an ideal choice for a game that was even more working-class than Manic Miner and Monty Mole put together. The game was the first of its genre to allow the player to control a number of different characters and each unique personality was incorporated into the tune. But the song was more than just a round the piano cockney boozer singalong, it actually complemented the game-play by giving the player tips on how to complete the puzzles. This gave even more incentive to buying the original game rather than loading it from a c90 home-made compilation of ill-gotten copies. With plenty of humorous one liners and a fantastically catchy chorus, Everyone’s a Wally may not be the kind of song that you would want to hear at the local night club, but as a nostalgic look back at 80’s Britain it is perfect compliment to an absolute gem of a game. A year later Melbourne House released their adventure game Dodgy Geezers, which included a similarly styled song recorded by programmers Trevor Lever and Peter Jones. Whilst is was an amusing enough attempt, it couldn’t compare with Berry’s effort and Lever and Jones summed it nicely on the games inlay when the described it as “a diabolical song on the flipside of the tape“. Incentive Software were shaking up the industry and living up to their name in ’85 by offering unique reasons to buy their games. Initially this was by offering cash prizes for high scores (though to a lesser extent than Mel Croucher’s Automata who created real life treasure hunts, such as the fantastically titled ‘My Name is Uncle Groucho and You Have Won a Fat Cigar’). But when they released the excellent puzzler Confuzion, they decided to include a free musical track by the little known Band Private Property. The game itself was unique (for the time) where you had to join pieces of fuse wire in a similar style to the later and much better known Pipe-Mania. The music track, though featuring some slightly dodgy vocals, was a competent Indi styled ditty that is reminiscent of The Mighty Lemondrops (‘who?’ I hear you ask! ), though I am sure the band would rather be compared to Echo and the Bunnymen. To fuse the two artforms a re-working of the tune by Rob Hubbard was also used as the games title tune. But even more interesting is the fact that the songs lyrics were written by one Matthew Smith. 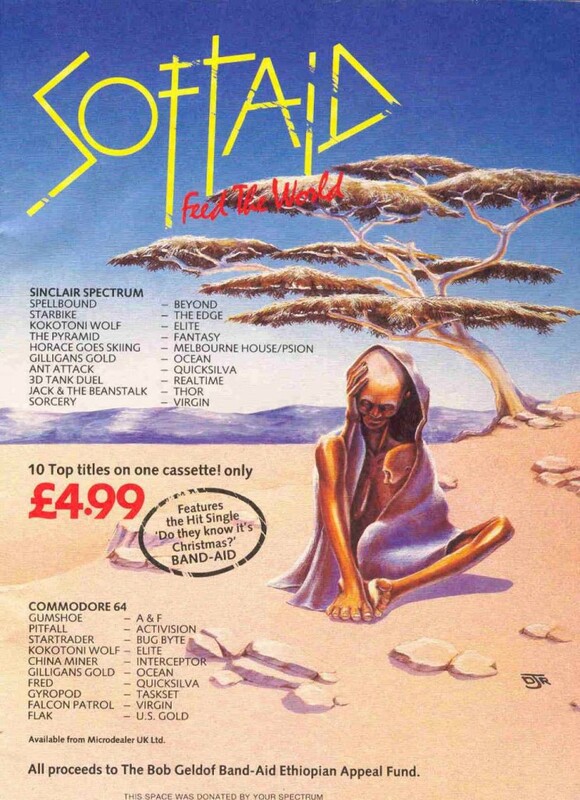 1985 was also the year that Virgin Software did their bit to support Sir Bob in his crusade against famine in Ethiopia by releasing their Soft Aid compilation. As well as games from some big names of the day, they also gave you the Band Aid song ‘Do They Know its Christmas’, which given that the game was released in July makes it a very strange ‘gift’. But it was for charidee, so I suppose they can be forgiven. By 1988 the games industry was changing and this kind of freebie was making way for the 16 bit ‘big-boxes’ with their games on disk and free novellas, maps and other such items. But there was still time for Ocean to give the free audio tape one last try. As it was also the year of the Seoul Olympics and Daley Thompson was about to fail miserably in his attempt to get a third consecutive Olympic gold medal, what better time to drag the original joystick-waggler back on to our screens for another game? Four years on from the original DT’s Decathlon and Ocean needed to come up with a good hook to support what was basically the same game with some graphical bells and whistles. But this was the year that New Order’s remix of Blue Monday was set on its way to becoming the best selling twelve inch single of all time, so you would be forgiven for thinking that Daley Thompson’s Olympic Challenge electro-pop theme (that was also used in chiptune form as the in-game theme) was a masterstroke by the marketing department. Unfortunately, whilst in-game it was a very good example of what chips such as the Spectrum 128k’s AY could produce, as a standalone audio track it was less than inspiring, sounding more like a free backing track on a cheap Casio keyboard than a New Order tune. After that games on tape quickly disappeared and so too did the concept of free audio tracks. CD became the medium of choice and you were more likely to see special editions containing the in-game music sold on a limited edition separate disc or given away only with pre-orders rather than the unique offerings from the 8 bit days. This has continued into today where games from the likes of EA come loaded with huge compilations of ready made tunes from recognised artists. This unfortunately feels too corporate as labels try to push their up and comings or publishers try to gloss over a poor game with exclusive songs that you will only ever hear whilst shooting up an urban metropolis or racing down an autobahn. Don’t get me wrong, games such as Guitar Hero and Rock Band made excellent use of licensed track that aren’t just in the background, they ARE the game. But where have the risk takers gone in the modern world? Come on Harmonix, I dare you to put Everyone’s a Wally in the next Rock Band game!